This Easter weekend (March 25 to March 27) includes a Cat Art Show, a grunion run, poolside Easter brunch, Easter egg hunts all over the city, a potato chip pop-up shop, California’s Strongest Man Contest, and lots more to choose from (and if you want a list of ONLY Easter specific ideas, you can check out list 20 Terrific Things to Do for Easter in L.A.). 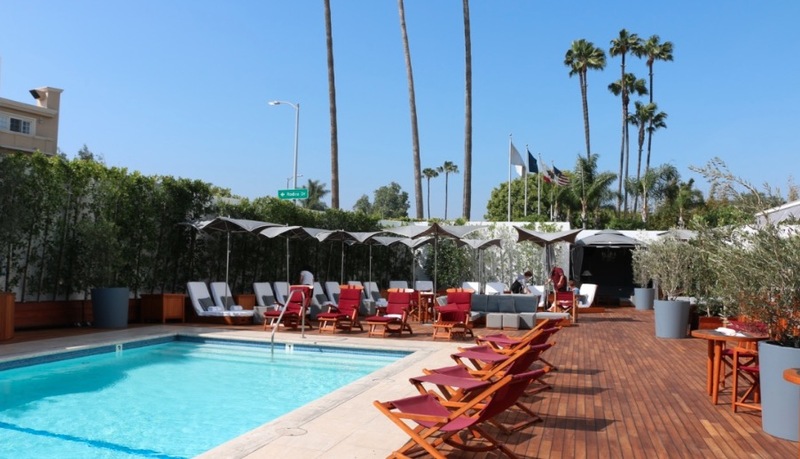 The pool at Mr. C in Beverly Hills. Credit: Brian Champlin / We Like L.A.
Cabrillo Marine Aquarium in San Pedro is hosting a ‘Meet the Grunion’ event this Friday night. It includes an educational auditorium program and guided observation on the beach during the spawning of these silver fish. The event runs from 8:00pm – 12:00am. The cost is $5 for adult, non-members. It’s baaack… Cat Art Show LA drew thousands in 2014 and this year might even be bigger. Come down to Think Tank Gallery in DTLA and view over 70 globally-recognized artists including Mark Ryden, Mick Rock AND Norman Reedus ( from The Walking Dead) among others. Opening night is Thursday. Exhibition runs through Sunday. The Last Book Review event series blends music, comedy, and storytelling into a unique monthly show at the Last Bookstore in DTLA. From March 25-27, the LA Zoo will host its annual celebration of Spring and Easter with crafts, music, and real live bunnies for your petting pleasure! The Easter fun is available 10:00am-4:00pm throughout all three days. If you love eggs, listen up! Demitasse Roastery & Kitchen in Hollywood will host a five-course Easter Egg Tasting Menu developed by Executive Chef Jeff Lustre. Dine on quail egg drop soup, coddled hen egg, duck egg ravioli, emu steak and eggs and Goose Tocino de Cielo egg custard. Tickets to the tasting are $60.00 per person, $80.00 with wine pairings and purchasable online for both Friday and Saturday tastings. Captured Aural Phantasy Theater is the only group authorized by 1950’s publisher EC to perform their comics. Come see their new show WEIRD SCI-FI 3D based on a recently uncovered 1954 3D sci-fi comic book. The show will run for two nights only (Friday and Saturday) at the Bob Baker Marionette Theater. 3-D glasses will be provided. Three days jam-packed with Q&As, premiere screenings, special guests, signings and an onstage Masquerade competition all at the Los Angeles Convention Center for Wonder Con happening March 25 through 27. This Friday, The Continental Club will present Yamato Sake Night, a free sake tasting in honor of Yamato Sake’s launch in the states. The evening will feature music from DJ Pyro, HILOW, TJ OKA, and more. Sake tasting (9:00pm-2:00am) only available while supplies last. HALSTON HERITAGE is having a sample sale this Friday from 9:00am – 4:00pm at the Cooper Building. They’re offering up to 70% off women’s ready-to-wear, dresses and handbags. From March 19-27 the Griffith Observatory will be doing twice-daily Let’s Make a Comet demonstrations showing how to make a real-life comet out of ordinary household materials and a little bit of dry ice. SPLENDID and ELLA MOSS are hosting a warehouse sale at The Cooper Building. Shop up to 90% off retail prices for women, men, tween, toddler and baby. Taking place Friday 9:00am-4:00pm and Saturday 9:00am-2:00pm. Maz Jobrani, best known as a founding member of the Axis of Evil Comedy Tour a show that stared top Middle Eastern-American comics will share the bill this Saturday with Adam DeVine formerly of Workaholics, Joe Rogan, Nikki Glaser and other top Hollywood comedians. Taking place at The Comedy Store. More information and discount tickets via Goldstar. Unlike the usual dated presentations and magic tricks, Trace is an innovator in magic recognized by the International Brotherhood of Magicians, International Federation of Magic Societies and by the Academy of Magical Arts, which is also known as The Magic Castle. Come see him dazzle the crowds with his mystifying feats for one night only this month. 60,000 Easter eggs are hidden all around the Rose Bowl stadium for the annual Easter celebration children will get to enjoy face painting, balloon animals, photos with the Easter Bunny and an Egg-celent brunch. The egg hunt is free, brunch cost $20 for ages 9 and up. The LA Aboretum in Arcadia will host an Easter egg hunt for kids of all ages. Reservations are not required and baskets for the hunt will be provided. Tickets cost $5 per child (plus admission). Easter Eggstravaganza will include an Easter egg hunt and crafts for kids on Saturday. Bring your own basket and meet and greet with the Easter Bunny! This event is free. 28. Mildred Pierce on the Big Screen in 35mm at the Egyptian Theatre Plus Fried Chicken! Mildred Pierce will be screened in 35mm this Saturday, its a story about a housewife’s rise in the restaurant business in Los Angeles. For the full experience come early for some fried chicken and pie, just like Mildred used to make. Lunch will be for sale starting at 12:30pm. Diners will be able to choose from crispy light or dark meat fried chicken and a choice of mashed potatoes or mac ‘n cheese curtesy of Alex Peyton Events and an assortment of pies from the Nickel Diner will be availble for desert. The Pasadena Playhouse and Gay Men’s Chorus of Los Angeles will host a special night for the LGBT community. The event will feature a performance of the West Coast premiere of Harvey Fierstein’s Casa Valentina, and a 7:00pm pre-show mixer in the Playhouse library. All tickets are $50 and include a front orchestra or front mezzanine seat to show and admittance to the party. Superunnatural, is a group exhibition featuring Kelsey Beckett, Elliot Brown, Peter Chan, Shawn Cheng, and Rebecca Green. Kelsey Beckett has a hand for delicately illustrating women. Elliot Brown paints texturally rich realistic scenes of everyday life. Peter Chan’s scenic works are both soft and organic while his characters are imaginative and unique. Shawn Cheng’s work is versatile and eclectic often depicting Japanese yokai. Rebecca Green’s illustrations are light hearted and whimsical. Together, they form the Superunnatural. Reception is this Saturday 6:30pm-10:00pm at Giant Robot 2 (22062 Sawtelle Boulevard Los Angeles, CA 90025) and will run through April 13, 2016. On Saturday the San Gabriel Kiwanis Club Foundation and the City of San Gabriel will host the 72nd Annual “Egg”straordinary Spring Celebration, offering fun for all families at Smith Park (232 W Broadway). Attendees can enjoy a morning full of spring activities, including free face painting, a generous all-you-can-eat pancake breakfast (for only $5!) pancake races and plenty of prizes. In addition, children will be divided into groups by age (2 and under, 3-5 years old, 6-7 years old, 8-9 years old) to hunt for 6,000 eggs hidden throughout the park. Color in Motion will be a limited engagement show at The Erin Hanson Gallery. The works will highlight three popular LA-based artists: expressionist painter, Pomm, landscape adventure photographer, Ian Ely and contemporary impressionist, Erin Hanson. The evening will offer a unique and immersive art experience with live music by The Happiness Jazz Band. French Chef Ludo Lefebvre brings his famous buttermilk Provencal Fried Chicken inspired menu to the Universal CityWalk with the grand opening of LudoBird, serving up a vibrant and flavorful take on the American classic fried chicken sandwich, beginning this Saturday. The British/American duo is back at iO West for their vagabond sketch show of 27 sketches performed in 55 minutes, it’s a fast-paced, classic comedy appealing to teenage boys and as they like claim grandmas alike! “Masters Of Wrong,” the newest body of work from leading German graffiti artist duo HERAKUT, makes it’s debut this Saturday, March 26 from 7:00pm-11:00 p.m. (on display through April 20) at the Corey Helford Gallery’s new 12,000 sq. ft. space in downtown Los Angeles. Watch some modern Gladiator types battle to become California’s Strongest Man. Held in Huntington Beach this competition is free to attend for spectators from 9:30am-2:30pm. The Set Shop is hosting a vintage pop-up this Saturday afternoon in Downtown L.A. Expect clothing and accessories from the 1900-1970 to be on sale. C. K. Farnsworth’s Mobile Soda Shop will be on hand with ice cream treats and hot dogs. A free live taping of indie political comedy show Bad News will feature hilarious professional comedians from Comedy Central, NBC, MTV, FX, Netflix, and The World Famous Comedy Store. Plus cheap beer for the 99%! Come down to ACME Comedy West (135 N. La Brea Ave.) at 7:30pm. Reserve your FREE tickets here. The Queen Mary wants you to have an “egg-cellent” Sunday. Come down to the ship for an Easter Egg Hunt with a special egg that contains a Golden Ticket for the grand Queen Mary Easter basket prize. A champagne brunch ($69.95 for adults and $24.95 for children) will be available for parents and kids who’ve worked up an appetite while on the search for the Easter Bunny. Spend Easter morning at the Aquarium of the Pacific with a delightful breakfast from 8:00am-10:30am. For $45 per adult and $25 a child, the price includes sweet and savory breakfast pastries, Blue Whale Breakfast Casserole, Citrus Ham, and a $5 gift certificate to Pacific Collections Gift Store. It’s rabbit season! Celebrate Easter Sunday by watching the most famous rabbit Bugs Bunny on the big screen at the Aero Theater in Santa Monica. The theater will have an egg hunt at 3:30pm, cartoons start at 4:00pm and tickets cost $11 but we found some for half off via Goldstar. Brentwood steakhouse Baltaire is gearing up for an epic buffet feast, featuring housemade pastries, an iced shellfish station, and a carving station. Opt for a boozy brunch and order a Bloody Mary or a Lavender Gin Fizz. The buffet is served from 9:00am-4:00pm and costs $75 per person and $45 for children. Esterel’s Easter Brunch buffet is an endless spread of deliciousness, for $95 a person you get brunch dishes like shrimp cocktail, oysters, Smoked Salmon & Charcuterie, Quiche au Fromage & Quiche Lorraine, Crepes, a dessert station, and something called the chef edible garden. Beverly Hills hotel and restaurant Mr.C will host a Venetian-style buffet for Easter brunch with live music, and a mini Easter egg hunt. Expect Cipriani classic pastas, fresh made waffles, a carving station and an ice cream and gelato stand. The brunch buffet cost $105 per person ($49 children 4-12 years old) and you can tack on bottomless Bellinis for an additional $30 per person. Girl Scouts Troop #3175 collaboration with Chef Ben Ford’s pastry team produced the TROOP #3175 SA’MORES MINI SUNDAE a vanilla ice cream, Samoa cookie crumble sundae drizzled in chocolate sauce, passion fruit sauce and caramelized marshmallow toppings. It can be yours for $7. Only available through the end of the month! The Rock n Roll Wrestling Bash makes it’s debut in the United States this Sunday. If you’re a lover of trash entertainment, wrestling, b movies, rock n roll, metal and booze (who isn’t?) this is sure to entertain. Come celebrate the Iranian/Persian New Year this Sunday, there will be plenty of vendors, food, drinks and a afternoon parade. Taking place in Westwood between Wilshire Blvd and Westwood Blvd from 1:00pm-5:00pm. This event is free and all ages are welcome.